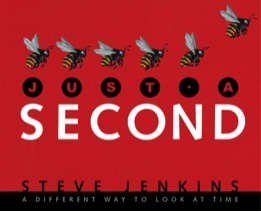 Steve Jenkins’ picture book, Just a Second-a different way to look at time, is full of fascinating notions, ideas, and facts about time. I happened to run across the book about a year ago, and listed it on my Amazon wish list, and forgot about it until last week. I was looking for a resource and as a last resort, checked my wish list–and there was the book. With the magic that is Amazon, I ordered it up and it was waiting for me when I got home from my latest trip yesterday morning. The boys in my house are watching a movie I am not interested in, so I spent some time with the book this evening. It’s fabulous. This is a great book to read with kids. The illustrations are really nice, all labeled with captions that are interesting, in terms of the information they contain and in the language used. The pages are loaded with lots of ideas to talk about with kids; they are phenomenal conversation starters. Certainly lots to be curious about. Have fun conversing with kids!